Clint Dempsey made headlines in the run-up to the Gold Cup, receiving a suspension and losing the USMNT captaincy. But on Tuesday, he proved he wouldn't let the noise faze him, scoring both goals in the USA's win over Honduras in the Gold Cup. FRISCO, Texas — There was heat, for sure, but it was only in the air, hovering in a thick humid blanket over sold-out Toyota Stadium. There was no heat directed toward Clint Dempsey—not from the fans who filled the Frisco, Texas, arena located a few hours’ drive from where he grew up or from his teammates. And there certainly was no heat inside his own head. There, Dempsey was cool and collected. And it was that clarity and confidence that made the difference for the U.S. national team in Tuesday’s Gold Cup opener, which it very well could have lost. 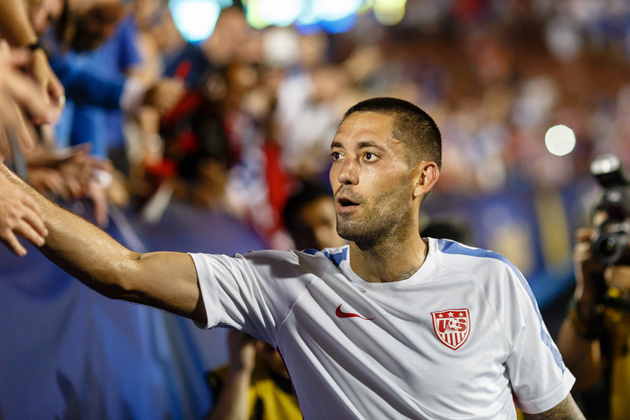 Instead, the Americans survived Honduras, 2–1, thanks to Dempsey’s two goals. When announcing his decision to transfer the national team captaincy from Dempsey to Michael Bradley prior to the Gold Cup, U.S. coach Jurgen Klinsmann said, “It was just important to take the heat off of Clint.” Dempsey was coming off a three-game MLS suspension that followed his June 16 meltdown in a U.S. Open Cup loss to the Portland Timbers, during which he grabbed the referee’s notebook, ripped it and threw it to the turf while protesting the ejection of a Seattle Sounders teammate. A two-year Open Cup ban also was imposed. Dempsey, 32, had been the captain since March 2013. He’s not the type who gives flowery speeches or engages in locker room-rallying sentiment. Rather, as goalkeeper Brad Guzan said Tuesday, Dempsey “leads by example.” He is relentless, daring and almost always delivers when it matters. He's the only American to score in three World Cups, and on Tuesday, he got an uneven U.S. squad started down the road toward a potential sixth continental title. There didn’t seem to be any question in Dempsey’s mind that the pre-Gold Cup discussion about his Open Cup malfeasance, the captaincy or his future as the national team’s go-to scorer in the clutch would weigh on him come game time. He has, as he said, typically delivered when called upon. And on Tuesday, he did so again. Dempsey’s goals on Tuesday weren’t works of art, but they were solid striker’s goals nonetheless. Sometimes opportunism, an ability to read the play and timely technique is sufficient. He opened the scoring in the 25th minute after a stretch of Honduran dominance. Jozy Altidore’s bid was saved by goalkeeper Donis Escober, and Dempsey alertly nodded home the rebound. In the 64th, Dempsey doubled the U.S. lead when he rose to meet a perfect, curling free kick from Bradley and headed the ball down and just inside the right post. It was his first two-goal game for the national team in two years. He now has four international goals in 2015 and 43 in his career, the second most in U.S. history. Dempsey made it sound simple, but little was easy for the U.S. on a night when Honduras made the hosts labor for the win. Los Catrachos were on the front foot early and again during the last half hour, when they scored once and nearly pulled level. The difference in the game was that Dempsey converted his chances. Dempsey obviously had no issue putting everything else aside and focusing on what he loves doing—and what he does best. Captaincy or not, he has a place in American soccer history and his teammates’ respect because of an ability to make peace amid the noise, to find the seam in a frantic penalty area and to take the responsibility, and the heat, when the stakes are high.